I covered writing US business letters, but I know we have a number of readers in the United Kingdom too – or readers who might want to write to companies within the UK. I’ll just be covering the formatting here rather than explaining again why each element is included, so you might want to read the article on US business letters first. Just as with the US examples, I’ll break the letter down into the main elements, working from the top to the bottom. Your address, also known as the “return address”, comes first (leave this off if you’re using letter-headed paper). Your return address should be right-justified. In the UK, the day comes before the month, and it is fine to put “st”, “nd” or “th” after the day’s date, eg. “15th” “1st” or “2nd”. You can position the date on the right or on the left of your letter. Beneath this, you should put the recipient’s name and address, just as it would appear on the envelope. If you’re using a window envelope, make sure it’ll show through when the paper is inserted. The recipient’s name and address should be positioned on the left-hand side. 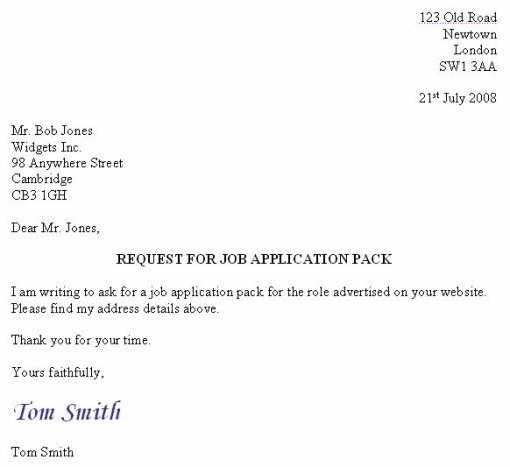 After their address, you should leave a line’s space then put “Dear Mr Jones”, “Dear Bob” or “Dear Sir/Madam” as appropriate. Follow this with a comma. The greeting should be left-aligned. You may want to include a subject for your letter — this is often helpful to the recipient, especially if they receive a lot of mail. If you do include a subject line, thsi should be directly below the “Dear name”, centered on the page, and can be in bold, uppercase or both to make it stand out. Each new paragraph should start at the left hand side. After the body of text, your letter should end with an appropriate closing phrase such as “Yours sincerely” or “With best regards”, and a comma. Leave several blank lines after the closing (so you can sign the letter after printing it), then type your name. You can optionally put your job title and company name on the line beneath this. The closing and your name and signature should all be on the left hand side. Still stuck? Try this letter writing exercise – it’s aimed at school-kids in the UK, but it’s good fun for adults too! 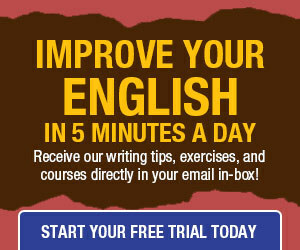 I notice that on both your US & UK examples, you have the subject line following the greeting. I’ve never seen this before, at least in the US. What standard does this follow? I’ve always been taught to write the subject between the recipient’s address and the greeting. How do you correctly format a greeting to an addressee who is unknown, using To Whom it may Concern? I would normally use “Dear Sir/Madam” rather than “To Whom It May Concern”. My understanding is that in the US, a reference line MAY be placed after the address, but that this is optional (and usually used for eg. a response to a previous letter or to a job application). The subject line is also optional but in all the examples I’ve seen, it appears directly above the body of the letter (US and UK). However, after a couple of comments on this, I’m suspecting that the reference line after the address is far more common than online examples have led me to believe! I’ll do a little more research and update the US business letter article as appropriate. Certainly don’t want to cause confusion. Yes, you don’t have enough iformation to help me on this website. I am amazed that anybody can find anything on this website. THANKS!!!!!! I’ve been looking for a well-mannered way of opening and closing emails to equal-level colleages, higher-level colleages (Directors, VPs and such), clients, and friends. “Dear” seems too formal, “Hi” seems too informal, while just starting with the persons name seems too abrupt (put it this way, I feel slightly offended if the sender just starts with my name, or worse, just jumps straight into the body of the message). The closing is difficult as well. “Yours faithfully” for people you “Dear Sir”d at the beginning is an easy enough to remember rule. “Yours sincerely” for ending messages that started with “Dear Fred” sounds a bit “hand wringing”. “With best regards” sounds better. “Best regards” is a bit less formal whereas just “Regards” on its own seems a bit curt. Please could you research correct email etiquette for the different classes of email and report on them? I am writing about the use of commas and st/nd/th. Back in Australia, I attended a professional writing course which outlined a very similar formal letter structure. There are two parts which were highlighted in the course as obsolete and not used in formal/professional context. The first is the use of st/nd/th after the number in the date. For instance the date in the above letter would be 21 July 2008. The second is the use of commas in the gretting and salutation. whoops – I enter before finishing. Note the lack of comma and full stop after the greeting, salutation and signed off name. This was from a progressive upto date course on professional writing. Does the same apply to the UK, or is it still considered a requirments to use commas and fullstops on the greeting and salutation, and the st/nd/th after the number in the date? This is one of the best post i even seen today, many thanks for this and i was bookmarking your site. Hope to see more article from you in the near future. Thanks for this buddy. This is very informative post i’ve seen today. I learned lot from you and hope you continue your great post, kindly do visit my blog also and give some feedback. Thank you for the useful article. But I’m still curious about fonts and letters’ size. I’ve been searching for this info on the Internet with no positive results. In the paragraph that reads “Yours faithfully” you would only write that if you dont know the recipient you would write Yours Sincerely. Your style is 20 years out of date! Punctuation should be open and everything including address and date should be left aligned. There should be no “rd/th” after numbers in date eg 22 November NOT 22nd November. You UK letter is incorrect. You have used yours faithfully to close a letter that started with Dear . * Use Dear Madam only if you know the gender of the recipient. Dear Sir/Madam is sloppy, but in common use. Cristian names should not be used in a business letter, which is always formal. Amendment on my previous post. The web site comments box filtered out the html. You UK letter is incorrect. You have used yours faithfully to close a letter that started with Dear Sir, or Dear Madam. Otherwise use yours sincerely. Enjoyed the site. The business letter has evolved quite considerably over the last 30 years. Currently I use as above with no punctuation or superscript except in the body. But I will use both addresses on the left if the letter is copied or using cut and paste. Endings Dear Anonymous – faithfully Dear Amos – sincerely. If it is a complaint I normally still use ‘I remain, Sir, your obedient servant’. Hopefully they note the sarcasm! I also like the ‘sorry for the long letter but I haven’t had time to write a short one! For informal greeting I have used ‘Greetings Alan’ and I also use Hi and Watcha’. But mostly I still use ‘Dear’ in emails and letters. However I do like to watch language and writing evolve and am always open to change, even if at first glance it doesn’t seem for the better! Im wondering – what if we start with ‘To whom it may concern’ what should the ending be? ‘Yours faithfully’? Since we don’t know who we are sending to? Also in British English you don’t put a dot after Mr. So Mr Bob Jones would be correct. Yours sincerely is if you do NOT know the person or, have used their formal title such as Dear Mr. Smith, Dr. Richards and such. Yours faithfully is if you have used the first name e.g. Dear Richard. Christian names CAN be used in a business letter, particularly if you have corresponded previously. Over formalising letters creates a mechanistic view and therefore implies that there is not a person attached. Dear Miss Penelope; not Dear Ms. It is very frustrating to see all these rules that have been invented by whomeve over the years. If my English teacher could see what has happened in the electronic age he would be firing [black]board rubbers (erasers to those cousins in USA!) at all of us and spinning in his grave – God rest him. P.S. -I should have spelt “Vassel” as “Vassal”; Please spare my blushes and correct during moderation! 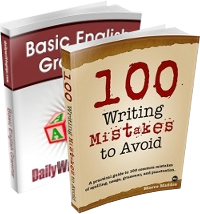 In British English, as in French, abbreviations whose first letter is the first letter of the affected word and whose second letter is the last letter of the affected word do not take a full stop after the second letter. However, should an abbreviation take the first letter and another letter before the last letter instead, a full stop should follow the abbreviation. In response to Andre Routh’s post of 14 May 2009, I can heartily recommend the closing that Air Chief Marshal Hugh Dowding used in his famous letter. It shows the proper feudal spirit even when the body of the message is talking back to the boss. Fighter Command, Royal Air Force. Goodmorning, please I want to address a letter to my boss through my manager requesting for a leave of absence. The addressing is confusing me. Could you please give me a hint on how the addressing should be like in the UK standard. Thanks a lot! Wow, awesome blog. Did you make this on your own? I’m sorry. I would like to get a complete lesson cours of how to write a business letter from you. and inersted in this facility. I want to thank you such a lot of for your job you have made in writing this posting. I am hoping the same most reliable work from you down the road also. Actually, there are a few things wrong with the so called UK letter/email. Most of them mentioned in the comments. Wouldn’t it have been better to get a British person to write the letter, or at least check it. Now it looks like everyone is more confused than when they started. With regards to a subject line. I understand that it should be positioned btween the salutation and the body of the letter. For example when speaking to someone we always say “hello” first before launching into conversation. The same rule applies to letter writing. While it seems the boffins have various opinions how things are done, at least I have been given a good head start in letter formatting. I doubt many really give a hoot these days any way. So again, Thank you for the fine work this site has achieved. My understanding is that the subject line should come after the salutation, since you address someone first, and then tell them what you are contacting them about. I, personally, also tend to include the reference in the subject line, since that way every bit of important information is in one place. The most important thing, surely, as many people have said, is to get your point across clearly and successfully. Everything else is relatively unimportant.